The standard UHF Chips/Tags (used by all timing systems on the market) cost just a few cents. They are used by each athlete for a single race or event, then disposed of. So, the cost of these chips is very important, as you (the timer) will pay for them! Most systems on the market ‘lock’ you into their timing system – meaning you can only use coded UHF chips on their timing equipment (for the life of the equipment). Although these chips are identical to ‘open’ chips (like the ones our system uses), they always have a much higher price point (often well over $1 USD per chip). This is a huge expense when timing many large events (see the costing chart below). Our timing systems – unlike the others – do not lock you into any UHF chip supplier and never will. We can supply ready-to go chips for less than half the cost of our competitors. Remember, UHF chips are cheap and easy to source from virtually anywhere – they are identical and work exactly the same way, and are even made by the same manufacturers. Some timing system vendors choose to encode the chips so that they only work on their system – and of course that ties you to their system at their nominated chip prices. Our system is an ‘open system’ that permits you to use any UHF timing chip on the market, often with huge savings even just in timing a single event. Our equipment is used around the world at thousands of events and more professional timers are realizing the huge savings our system can generate because of the low cost timing chips. Crunch the numbers and you will see there is really no alternative in the longer term. 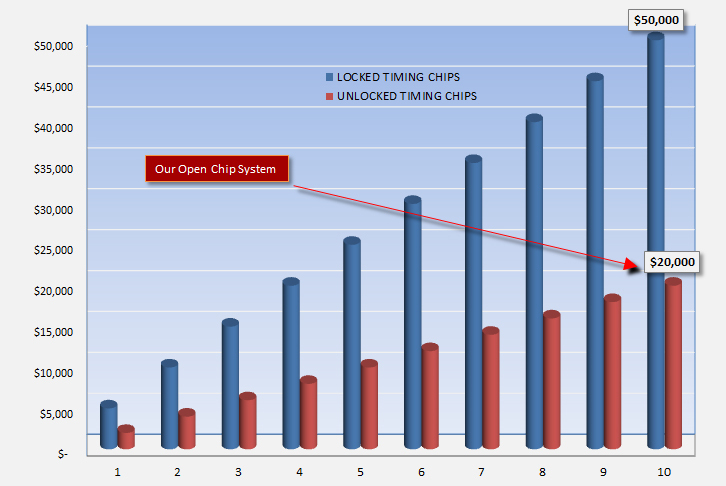 Imagine a single charity run with 20,000 competitors – a locked chip will routinely cost above $1 USD per chip. An identical unlocked chip (for example the Dogbone Monza r6 from Smartrac) will cost around 20-25c. The chips of course are used for just this race, then thrown out. So – the difference in cost for you as the race timer? Around $14,000 USD! Multiply this by the number of events held per year and this adds a huge boost to your bottom line. Other vendors of RFID race timing equipment will lock you into a ‘system’ or contract – you will also have to purchase and use their software in many instances. This is not how we operate – we have a much more open approach, providing our clients with the freedom and flexibility to set up and use our systems as they wish. Our clients have praised our system as they choose their own chips (at a far lower cost as mentioned above) and even their own software (which is readily available and is significantly cheaper than locked vendor sotfware). We don’t lock you into any software or contract – our system integrates smoothly and seamlessly with the world’s most advanced timing packages (such as RaceDirector, Racetec and Runscore to name a few). These are proven timing software solutions, used in the majority of races around the world on a daily basis. There is no need for us to develop software when our expertise is in the advanced timing hardware.